In a bowl, whip together the cream, sugar and vanilla until stiff peaks form. Chill until ready to use. In a small bain-marie, melt the chocolate. Line a tray with parchment paper. Dip half of each marshmallow in the melted chocolate. Shake off excess chocolate and set on the tray. Cool in the refrigerator for 15 minutes. If any melted chocolate remains after dipping, scrape it onto some parchment and set aside. In a medium saucepan, heat the milk on low until steaming. Add the truffles and the reserved chocolate and whisk until melted. Keep warm. 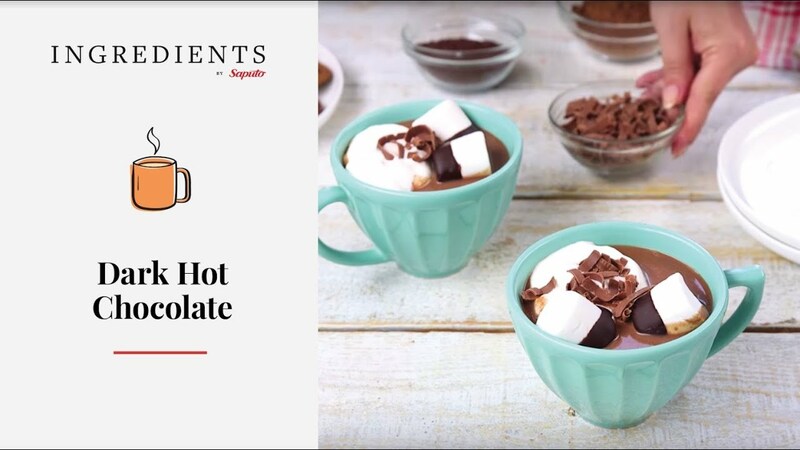 Serve hot chocolate with whipped cream and assorted garnishes, do-it-yourself style! Dark chocolate and milk chocolate are somewhat perishable. They should be well-wrapped in aluminum foil or wax paper to prevent all contact with light. Chocolate can be stored at room temperature in a dry place for up to one year. A thin white film may appear on the surface, but it does not change the characteristics of the chocolate.